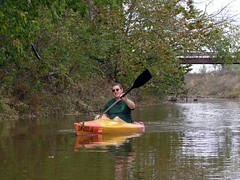 Reading this entry of yours brought back some memories for me - my first Kayaking experience. I teamed up with a lady then and since we were first time kayaking, we had some coordination problem and our kayak simply didn't move as fast or in the direction that we wanted it to go. In the end, she got seasick and I had to paddle all the way back to the shore. Tiring but very good experience. Thanks for the comment, BK! As much as Dianne and I love kayaking, we share a disdain for tandem kayaks. We rented one of the tiny tamdem SOT kayaks that are commonly available from various Illinois River canoe liveries a few years back. We nearly beat each other to death with the paddles....and Momma said: never again!